The shootings were so random — a parking lot, at a gas station, a guy mowing grass, a baby-sitter reading a book on a bus stop bench. They happened in a spree — in Maryland, Virginia, greater Washington, D.C. — and set off a frantic man hunt and car hunt. He had to be a “disaffected white male.” He called in threats and warnings. “Your children are not safe, anywhere, at any time”. Was the shooter driving a van? Or white truck? No, it was a “Blue Caprice.” And the “shooter” was two black men, John Allen Muhammad and a teen he treated as his “son,” Lee Malvo. “Blue Caprice” is a chilling portrait of motive, manipulation and mass murder. As Muhammad — never called by name in Alexandre Moors’ film — Isaiah Washington paints a portrait of brittle charm and embittered, bloody-minded grudges. We meet a doting father, see him take in a teen who has been abandoned by his mother, and then watch him use people, claim victimhood and eventually create a monster as his tool for revenge on a country this Army vet felt had done him wrong. Washington is brilliant in the part — scary, mysterious, but not the least bit unfathomable. The grown man meets the boy Lee (an intense yet vulnerable Tequan Richmond) in Antigua, and eventually takes him to Tacoma, Washington, where the ex-Army mechanic renews his friendship with an old Army buddy. Washington, Moors and screenwriter R.F.I. Porto let us see the wheels begin to turn in Muhammad’s head. He’s under a restraining order, kept away from his ex-wife and kids. With a “Do you love me?” he starts indoctrinating the teen with his vision for their exploits, the terror they will strike at the whole “house of cards” that a random shooting spree Muhammad feels will topple. We get nothing of the longer version of Muhammad’s own radicalization — his separation from the Army, his involvement with the Nation of Islam. And we see little hesitation, confusion or remorse in the boy, who curled up in the trunk of that late model blue Chevrolet that they bought with money stolen in a murder/robbery, and picked off targets with a high-powered rifle. Richmond gives us the arc of needy and unwanted to cold-eyed and cold-blooded without much humanity in between. And there’s no dwelling on the victims, when picking out even one of them for profiling would have added impact and emotion to the story. 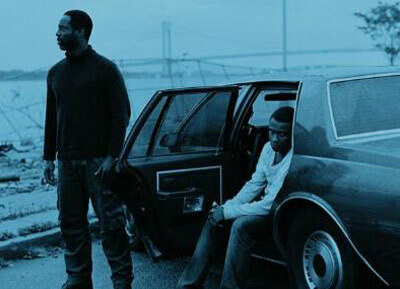 But “Blue Caprice” is as complete a portrait as the movies have given us of the disaffected among us, people whose sanity is as shaky as a house of cards, and the easy access to weapons and cultural anonymity that allows them to act out their dark fantasies of revenge on the unsuspecting. (Roger Moore’s interview with Isaiah Washington is here). MPAA Rating: R for disturbing violent content, language and brief drug use. Credits: Directed by Alexandre Moors written by R.F.I. Porto. An IFC/Sundance Select release.